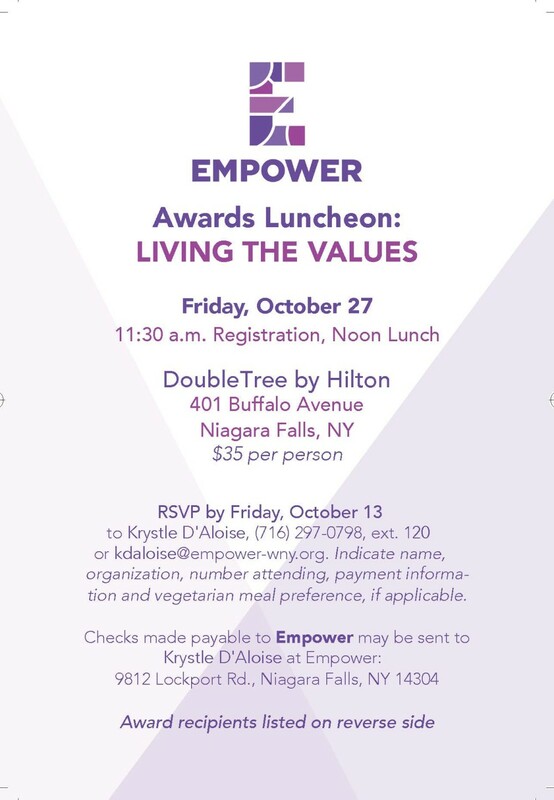 NIAGARA FALLS, N.Y., Oct. 16, 2017 – Empower, the not-for-profit organization formerly known as Niagara Cerebral Palsy, will hold its second annual Living the Values Awards Luncheon at noon on Friday, October 27 at DoubleTree by Hilton, 401 Buffalo Ave. Tickets are $35, and may be reserved at (716) 297-0798, x120 or kdaloise@empower-wny.org. Marshaun Walton will receive the Inspiring Individual Award because of the strides he has made by participating in Empower’s programs. 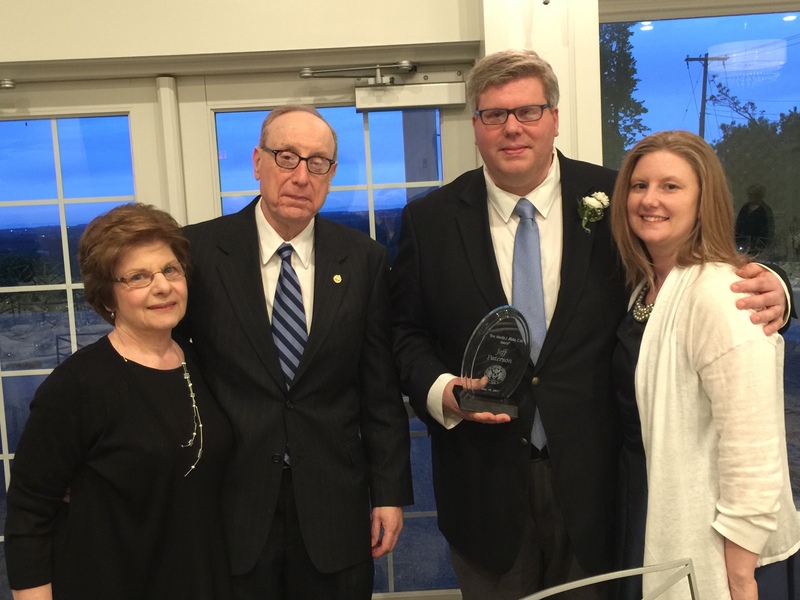 Attorney John R. Drexelius will receive the Dr. Salvatore M. Passanese Leadership Award because of his advocacy for people with disabilities as government affairs counsel to the Developmental Disabilities Alliance of Western New York. KeyBank and KeyBank Foundation will receive the Faithful Funder Award for their consistent financial support of Empower and its programs. Fashion Outlets of Niagara Falls USA will receive the Priceless Partner Award in recognition of the facility’s support of Empower’s bottle and can redemption center. Wegmans will receive the Exceptional Employer Award because of its track record in employing people with intellectual and developmental disabilities through Empower. This entry was posted in Our News on October 17, 2017 by Elizabeth Cardamone. Congratulations to Empower CEO Jeff Paterson for being recognized by Our Lady of Angels Association for his philanthropic involvement and leadership at its annual the Vincentian Charities Dinner in May. Empower has a rich history of responding to unmet community needs. In fact, in 1954, it was the lack of nearby services for children with cerebral palsy that led to the agency’s creation. That tradition will continue on September 5 with the opening of a new program for older adults called Empower for Elders. Another good example of community engagement is the restructuring that has taken place in the Job Training and Day Program division. Services were moved from 30th Street and MacKenna to more integrated settings like the redemption center. Staff, led by Kim Kiely, had to learn how to run a redemption center, serve customers and train workers in marketable job skills. This venture has been so successful that Empower is opening a second redemption center and adding another valuable service requested by customers, document scanning and shredding. Empower will continue to adjust and expand programming to ensure the people it serves and the broader Niagara community live their best lives. This entry was posted in Our News on August 11, 2017 by Elizabeth Cardamone. 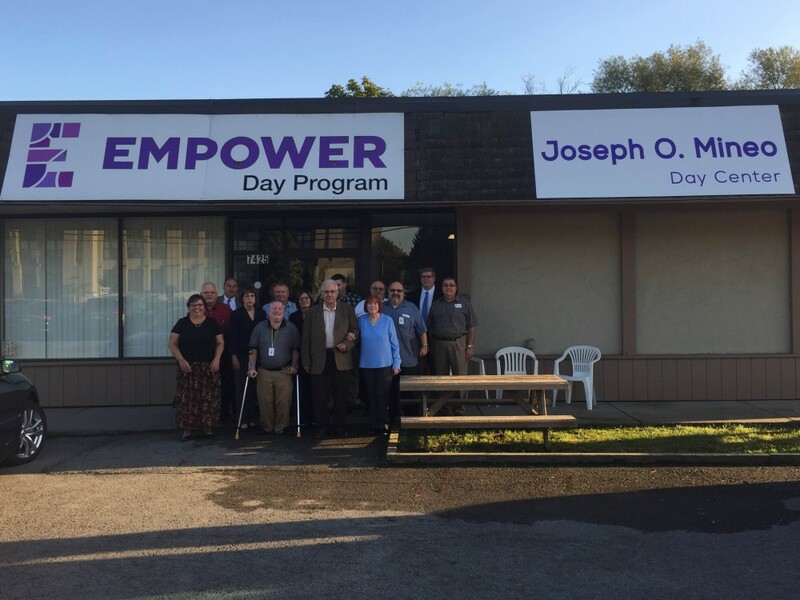 TOWN OF NIAGARA, N.Y., August 9, 2017 – Empower, the not-for-profit organization formerly known as Niagara Cerebral Palsy, will hold an open house for its new adult day program for older adults on Aug. 23 from 1 to 6 p.m. at 8962 Porter Rd. Beginning Sept. 5, Empower for Elders will serve older adults who live with adult children or spouses, and who need assistance with personal care and daily activities. 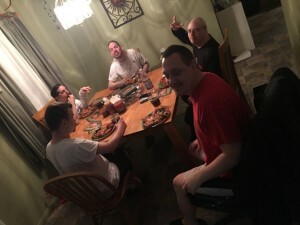 Participants will receive individualized care, light exercise, assistance with personal care, socialization, activities that promote independence and feelings of self-worth, and breakfast and lunch. The program offers respite to family caregivers, allowing them to work, run errands or take a break from caregiving duties. In addition, a new caregiver support group will enable family caregivers to meet, share experiences, ask questions and receive support. For more information or to enroll, contact Karen Smith, director of community health services, at (716) 297-0798, extension 163, or ksmith@empower-wny.org. Additional information is available at www.empower-wny.org. This entry was posted in Our News on August 9, 2017 by Elizabeth Cardamone. Empower for Elders is a new program for adults age 60 and over, including those who are physically frail, persons with dementia and/or memory loss of the Alzheimer’s type or related disorders. It is a structured group activity program that will provide socialization and supportive services in a caring environment. At the same time, Empower for Elders offers caregivers respite from their caregiving responsibilities. The program is based on the philosophy that each individual has a need and capacity for socialization which does not diminish with age; that socialization helps prevent depression, loneliness, and premature institutionalization; and that supportive services in a caring environment can enable people with functional impairments to live their lives more fully. Our goal is to provide a welcoming, home-like setting with warm, friendly, well-trained staff and volunteers who support the functioning, safety, and dignity of each participant. We will also be accepting gently used or new board games, card games and craft supplies for this new initiative. For more information, please contact Karen Smith, Director of Community Health Programs at 716-297-0798 ext 163 or ksmith@empower-wny.org. This entry was posted in Our News on May 16, 2017 by Elizabeth Cardamone. Butterflies were the inspiration for art made by some students for the second annual art show. Students got to watch the process of metamorphosis as live caterpillars changed to chrysalides and finally to beautiful butterflies, learning science and art simultaneously. But, the experience had an unexpected, additional benefit we are calling the butterfly effect: a student with autism who previously did not talk a lot began spontaneously speaking to the butterflies, encouraging them to fly! Preparations for the art show, which took place May 18, began with classes reading The Very Hungry Caterpillar by Eric Carle. In Ms. Shaila’s class, the caterpillar in the story came to life, fascinating students as they transformed from chrysalides to butterflies. Every morning, students gathered at the netted enclosure and asked “are the butterflies here yet?” When the butterflies finally came out, the students’ were very excited to see them. Ms. Shaila’s class made many craft activities based on The Very Hungry Caterpillar which also taught them facts about butterflies. For example, children learned that butterflies have upper and lower wings while making butterflies out of coffee filters and bingo markers. In another craft, the lesson that butterfly wings consist of soft and hard textures was taught while making butterfly collages with dried eggshells, soft tissue and dry colored rice and glue. The art displayed at the art show on May 18 is representative of hours of fun and learning made meaningful by being tied to real life experiences and through the use of multiple subjects and activities. Progress made by students, such as the one who began to spontaneously speak, shows the butterfly effect that occurs when this method of teaching is used. It is this standard of excellence that makes the Children’s Academy the best pre-k in town! After a 12-month advocacy initiative led by Cerebral Palsy Association of New York State and its affiliates, Governor Andrew Cuomo and the New York State Congress approved the 2017-18 state budget that included $45 million to raise salaries of direct care professionals who work directly with people with developmental disabilities. While this commitment is good news, #bfair2directcare will continue as $45 million is needed in each of the next six year’s budgets to ensure a living wage for these workers. Empower would like to thank Senator Robert Ortt and Assemblymember Angelo Morinello for their unwavering support of this effort. This entry was posted in Our News on May 15, 2017 by Elizabeth Cardamone. TOWN OF NIAGARA, N.Y., April 10, 2017 – Empower, the not-for-profit organization formerly known as Niagara Cerebral Palsy, will offer a free theater camp to children with autism, beginning June 6, 2017. Up to 40 students who are between the ages of 7 and 15 and who have autism spectrum disorder, will be accepted. To register, please contact Krystle D’Aloise at (716) 297-0798, ext. 120 or kdaloise@empower-wny.org. 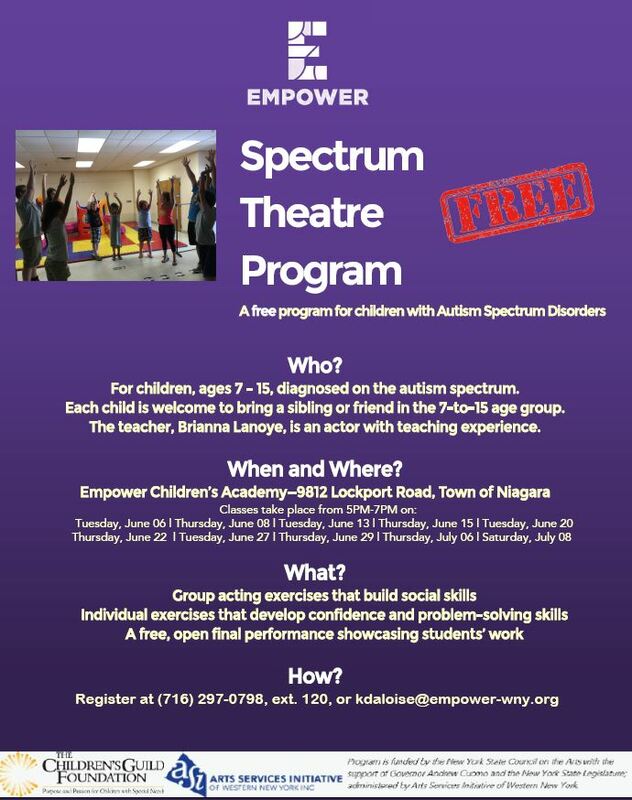 Called Spectrum Theater Program, the camp will meet twice a week, on Tuesdays and Thursdays, from 5 to 7 p.m., at Empower Children’s Academy, located at 9812 Lockport Road in the Town of Niagara. Theater instructors will lead students through group and individual acting exercises that build confidence, problem solving skills and social abilities. Students will focus on gestures, eye contact, voice projection, listening to each other’s perspectives and improvisational skills. They will develop a play out of their own imaginations, memorize lines and perform in front of a live audience on Saturday, July 8, 2017. With 300 employees and a $14 million budget, Empower is one of Western New York’s 50 largest nonprofit organizations. The administrative offices, preschool, community clinic and service coordination program are located on Lockport Road in the Town of Niagara. The job training and day programs division is based in Niagara Falls, while residential facilities are located throughout Niagara County. Licensed by the New York State Office for People with Developmental Disabilities and the New York State Education Department, Empower is an affiliate of the Cerebral Palsy Associations of New York State. This entry was posted in Our News on May 10, 2017 by Elizabeth Cardamone. 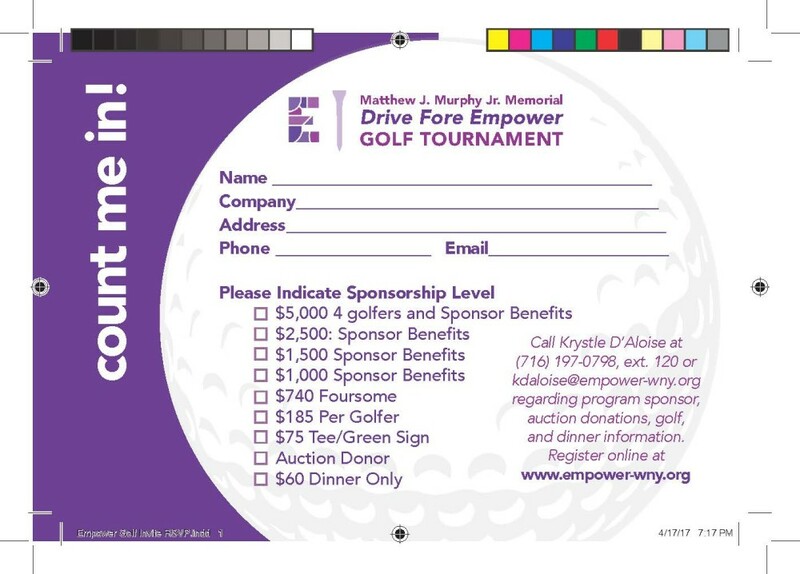 TOWN OF NIAGARA, N.Y., May 9, 2017 – Empower, the not-for-profit organization formerly known as Niagara Cerebral Palsy, will award Fran and Gary Hall the Chairman’s Award at its annual golf tournament. The golf tournament will take place on Monday, June 19 at the Niagara Frontier Country Club, 1058 Lake Rd., Youngstown, N.Y. 14174. The award will be presented at the post-tournament dinner, which will be held at 6:30 p.m. Dinner tickets are $60 per person,and may be purchased by phone at (716) 297-0798, ext. 120 or online at http://empower-wny.org. Space is still available for golfers as well. Fran and Gary Hall, longtime Niagara County residents and generous philanthropists, will receive this year’s Chairman’s Award for their generous support of Empower and numerous other community organizations. 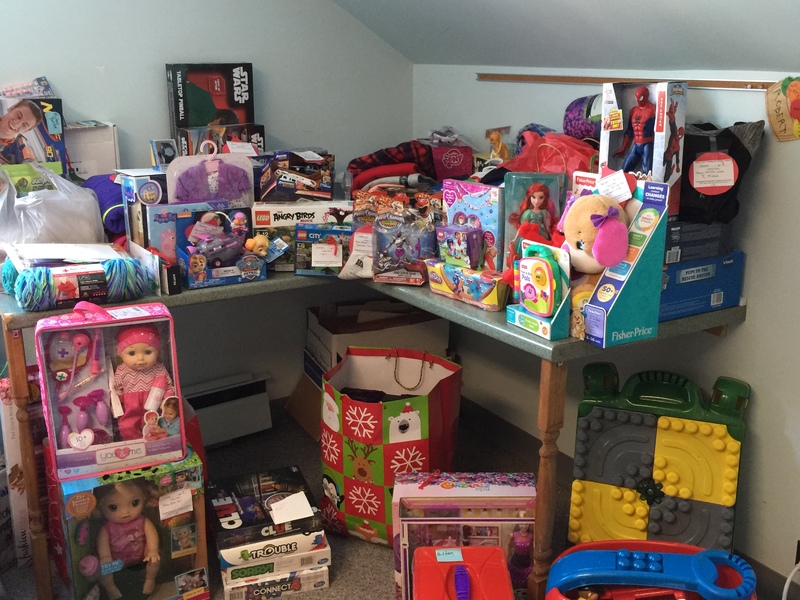 A gift from the Halls enabled Empower to add new flooring, furniture and recreational items to its day program in Niagara Falls. They also played a lead role in opening the new Niagara Community Center on 66th Street, which they have generously opened for weekly visits from individuals supported by Empower. Right after Thanksgiving, the Medicaid Service Coordination team put up a tree by the front door. On the tree were ornaments with gift requests from families served by this division who cannot afford to make these wishes come true for their children. 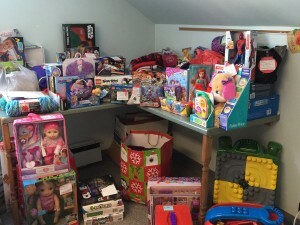 Thanks to the generosity of Empower staff and a $700 grant from the United Way of Greater Niagara Student Fund, the tree was bare well before the holiday and an abundance of gifts were donated. Thanks to everyone who participated. 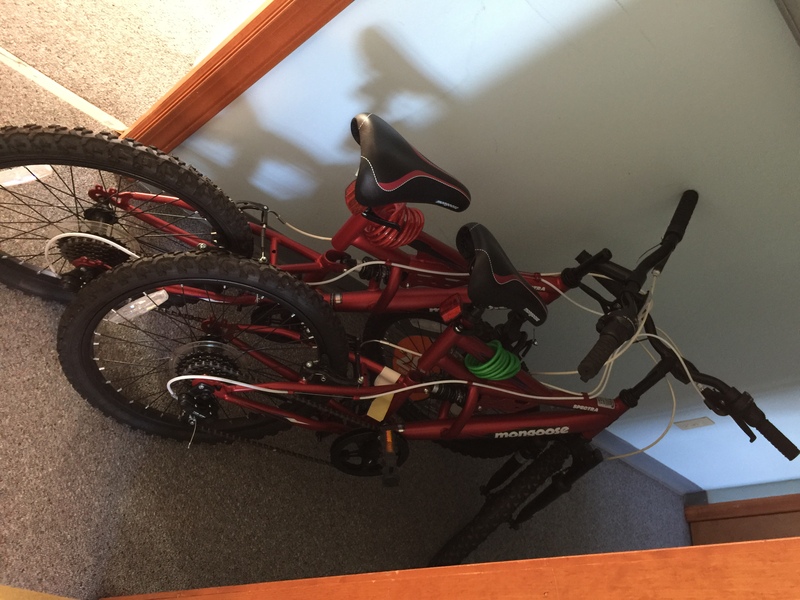 This entry was posted in Our News on February 23, 2017 by Elizabeth Cardamone. Once again, Community Housing haunted the halls of an innocent and unsuspecting fire hall for our annual Halloween Spooktacular party. This was a great time for not only our residents, but also our friends from the vocational division. Everyone enjoyed great food, music and scary costumes and decorations. In January, Frank Rice, a nurse in the community Housing division, was nominated for a Living the Values award by his co-worker, Anna Stickney. In this video, Anna explains how Frank embodies collaboration, one of Empower’s five core values. Community Housing celebrated the Super Bowl as any family does, with lots of snacks, hollering and mixed opinions about who should win.